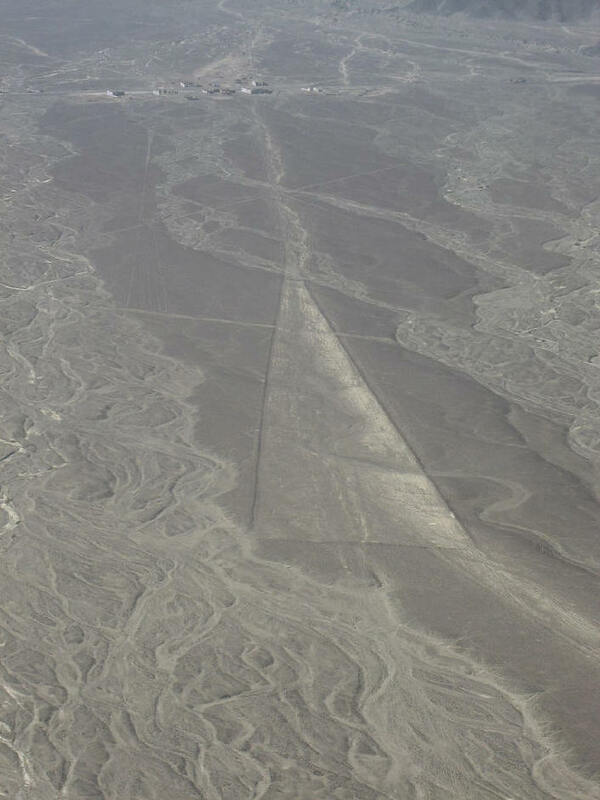 I have discovered the secrets of the pyramids, and have found out how the Egyptians and the ancient builders in Peru, Yucatan, and Asia, with only primitive tools, raised and set in place blocks of stone weighing many tons! In southern Peru lies one of mankind's greatest mysteries - 1000's of giant shapes etched into the desert sands. Find out who made them and why. 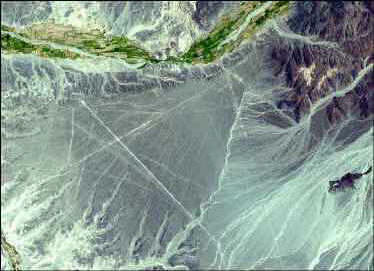 The high desert of Peru holds one of the most mystifying monuments of the known world—the massive-scale geoglyphs known as the Nasca Lines. 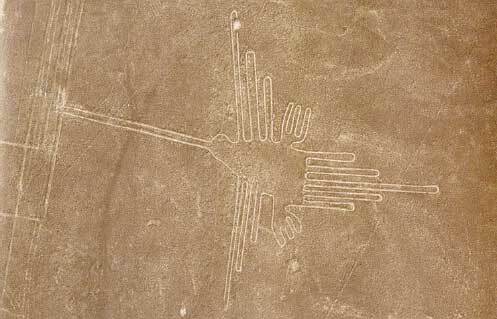 Ranging from geometric patterns to “drawings” of different animals and stylized human-like forms. 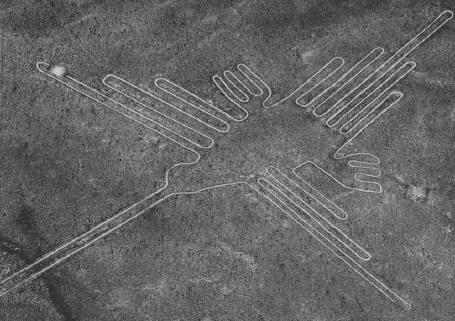 The ancient lines can only be truly taken in, their forms discerned, from high in the air, leaving generations mystified as to how these precise works could’ve been completed long before the documented invention of human flight. 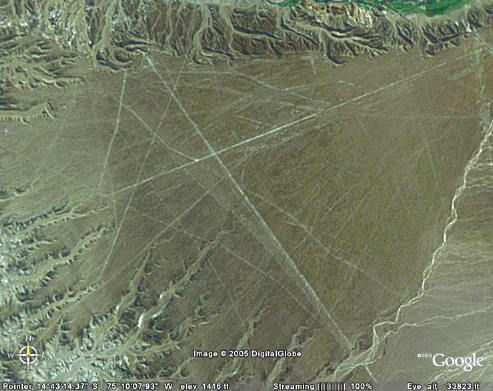 Are the lines signs left by an alien race? Landing strips for UFOs? 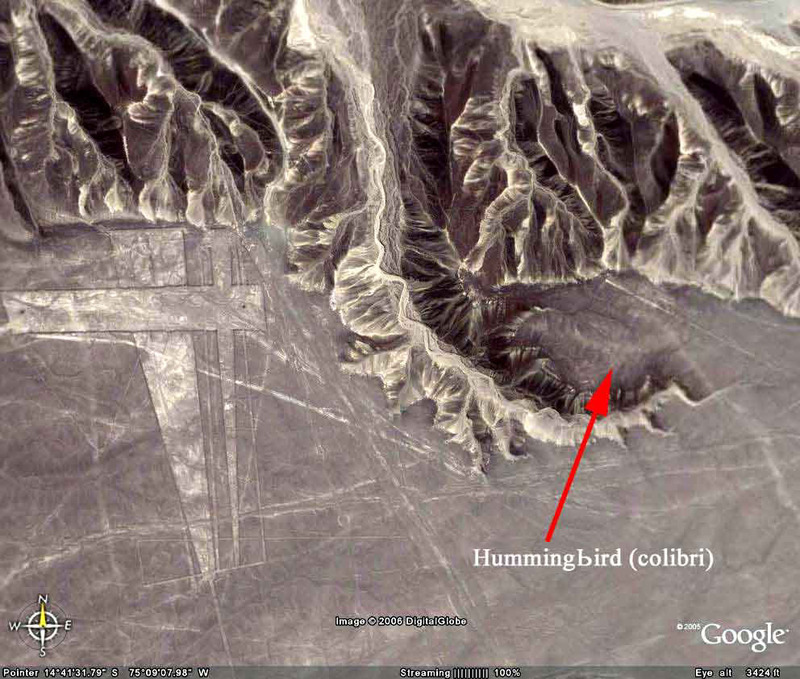 Relics of a ancient people far more advanced—capable of human flight—then previously imagined? Etched, as if by giants, onto the arid moonscape of Peru’s southern desert lies one of man’s greatest mysteries; the Nasca Lines. 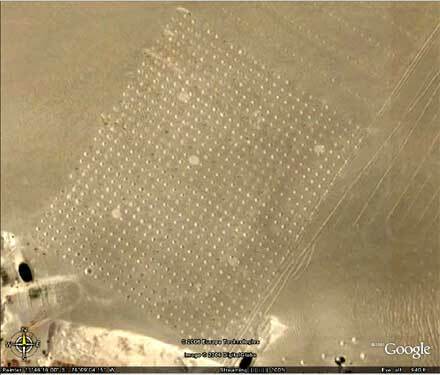 More than 15,000 geometric and animal-like patterns have been discovered criss-crossing the pampas like a vast puzzle. 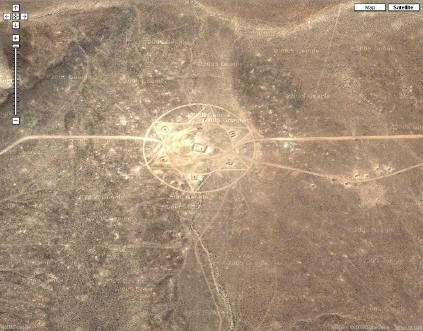 Who built them and what was their purpose? 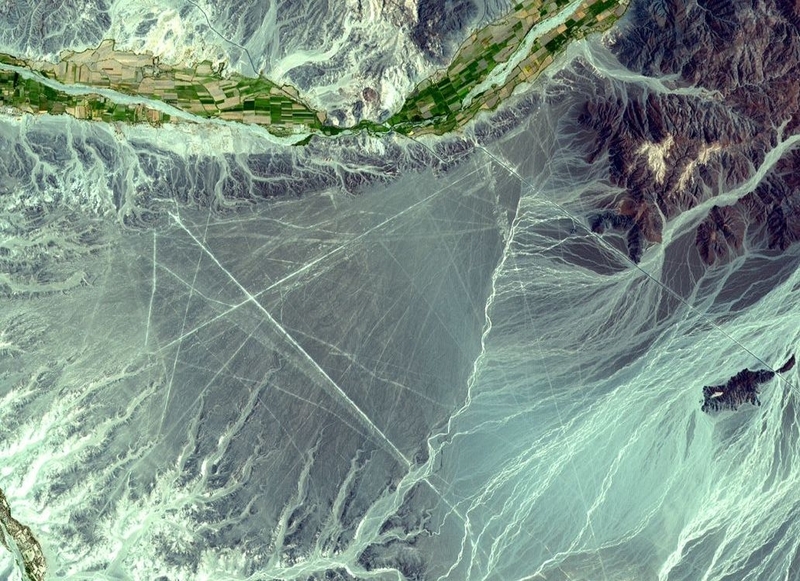 Ancient racetracks, landing strips for aliens, or perhaps a giant astronomical calendar? 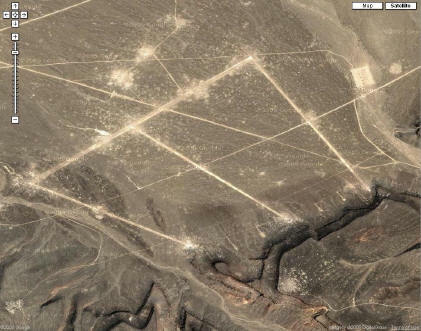 And are the Lines connected to the gruesome discovery of large cache’s of severed human heads. 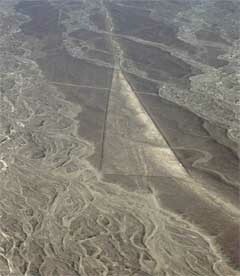 Now, after decades of misunderstanding, modern archaeology may finally have the answer. 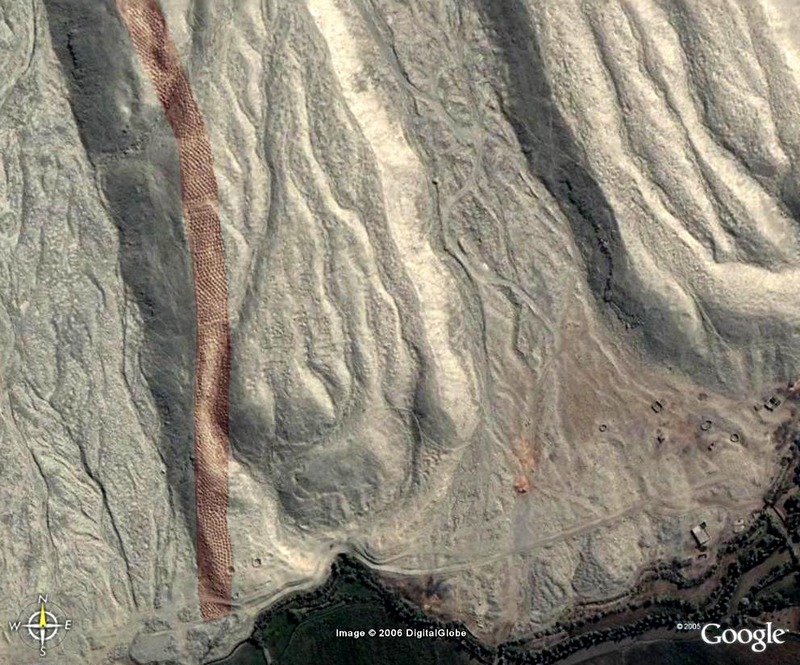 Excavations in the surrounding mountains are uncovering extraordinary clues about the people who made them and why. 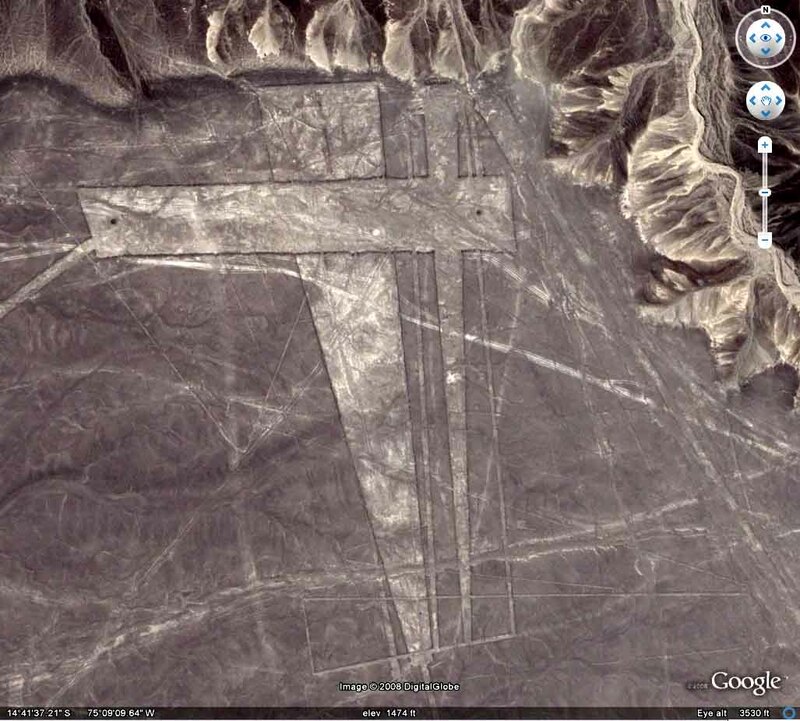 A long since vanished people, called the Nasca, flourished here between 200BC and 700AD. 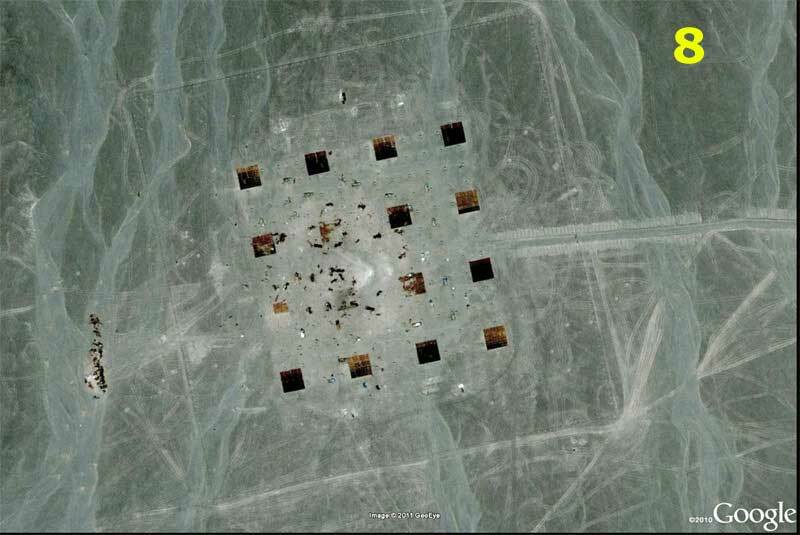 But the harsh environment led them to extreme measures in order to survive. 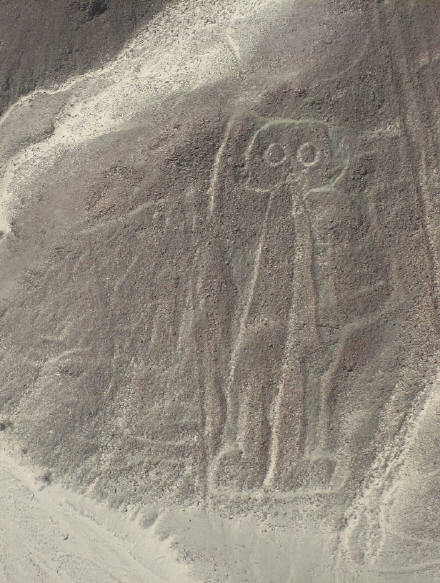 Archaeologist Christina Conlee recently made an extraordinary find: the skeleton of a young male, ceremonially buried but showing gruesome evidence of decapitation. In place of the missing human head, a ceramic “head jar” decorated with a striking image of a decapitated head with a tree sprouting from its skull. Conlee wonders who this person was? Why was he beheaded and yet buried with honor. Was he a captive taken in battle, or could he have been a willing sacrifice? And did his decapitation have anything to do with the lines? The discovery of large caches of human heads adds grisly weight to Conlee’s theories and helps unravel on of man’s great mysteries. 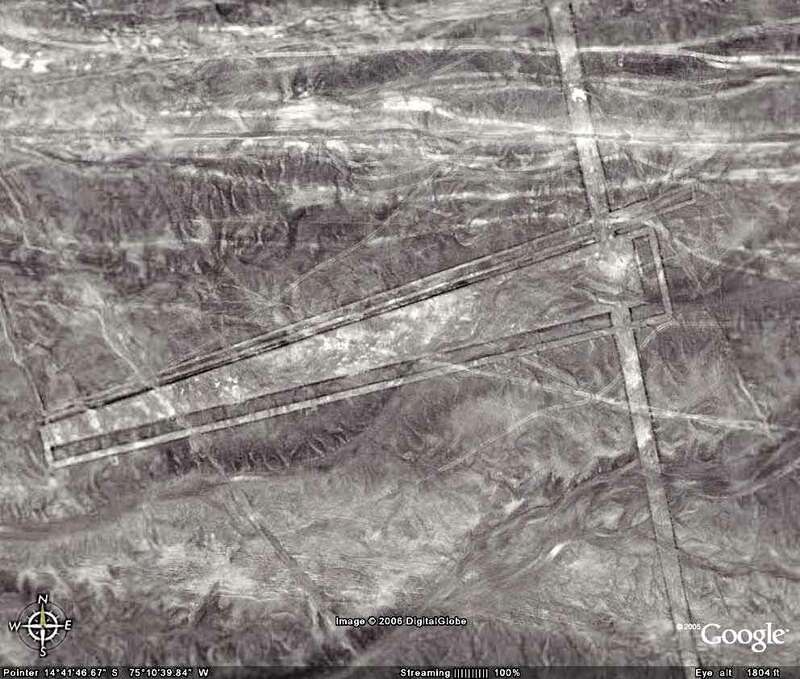 There are some mysterious marks which some call airports near the ancient city of Dunhuang in Gansu Province, I believe. I will provide solid evidence that these are nothing like an airport that I have ever heard of and I am a retired engineering manager and a pilot. 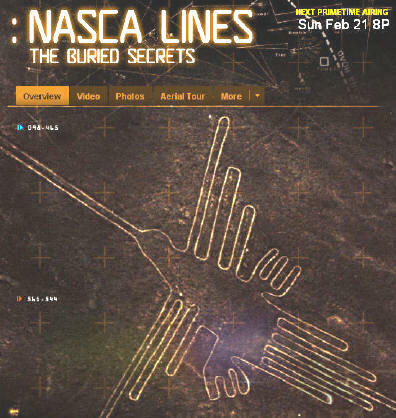 On Sunday, Feb 21, 2010, the National Geographic Channel presented a new documentary, Nasca Lines: Buried Secrets, from Edge West Productions, directed by celebrated British documentarian Philip J. Day. This in-depth doc brings new light to the lines and the mysteries surround their construction and purpose. 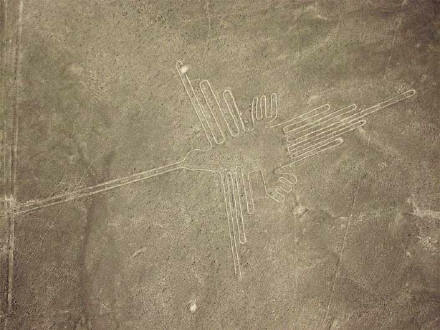 Recent archeological discoveries documented in the show give new insights to the people purported to have built the lines—their society, religion, practice of human sacrifice and much, much more. Are they ancient road maps or messages for visiting aliens? 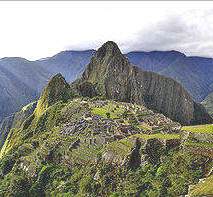 Lying at the foothill of Peru's Andes Mountains is the site of one of the world's greatest mysteries. Etched, as if by giants, onto its arid, moonscape plains are immense lines that stretch for miles, forming strange shapes recognizable only from the air. 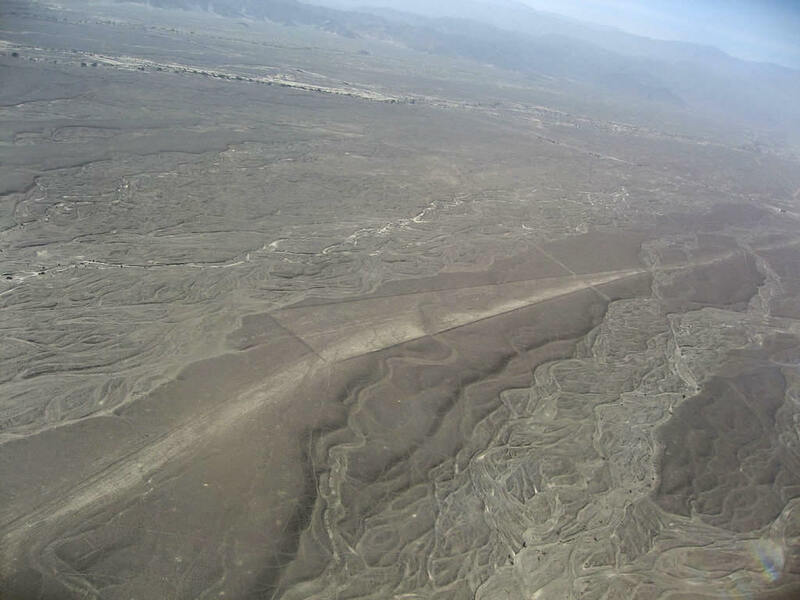 Now, a team of specialists from around the globe has come to southern Peru to investigate the Nasca Lines in the hope of uncovering their secrets. 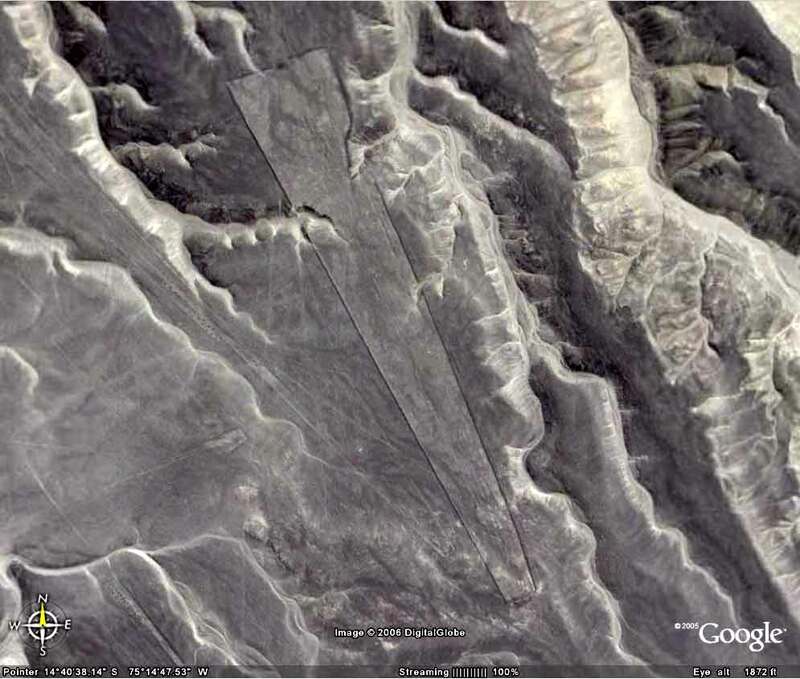 Nazca Lines: an ancient astronaut? If you have Google Earth installed, use this Nazca Google Earth Placemark file (Save and Open) and it will fly you to a location*. 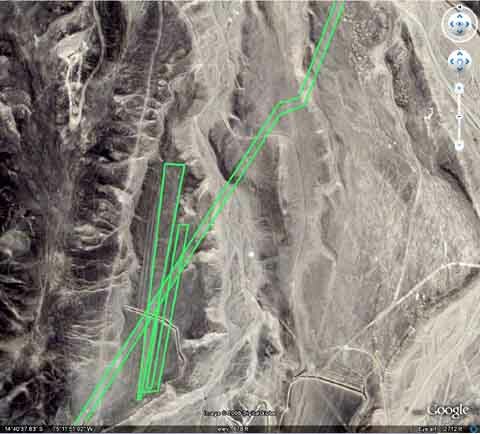 If not, you will need to install Google Earth first (available at http://earth.google.com ). CLICK on the image to enlarge and view coordinates. 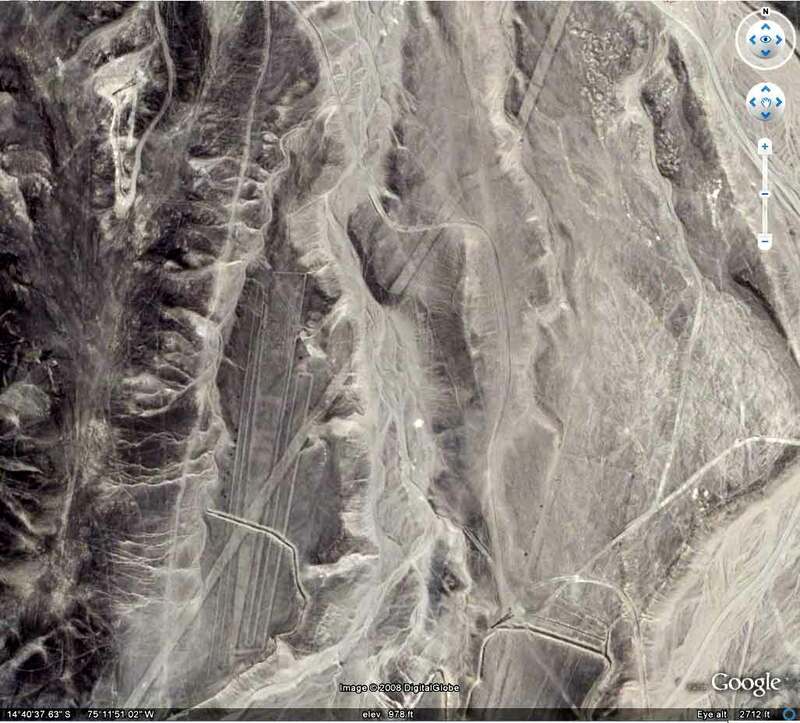 This is another strange road in the Pisco region in Peru. It is about 20m wide and goes for many miles through the desert. 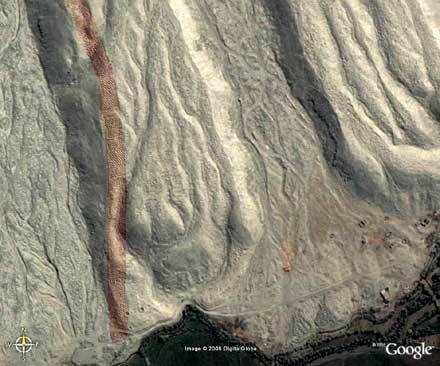 It is lighter than its surroundings and marked by small craters spread apart by approximately 200m. 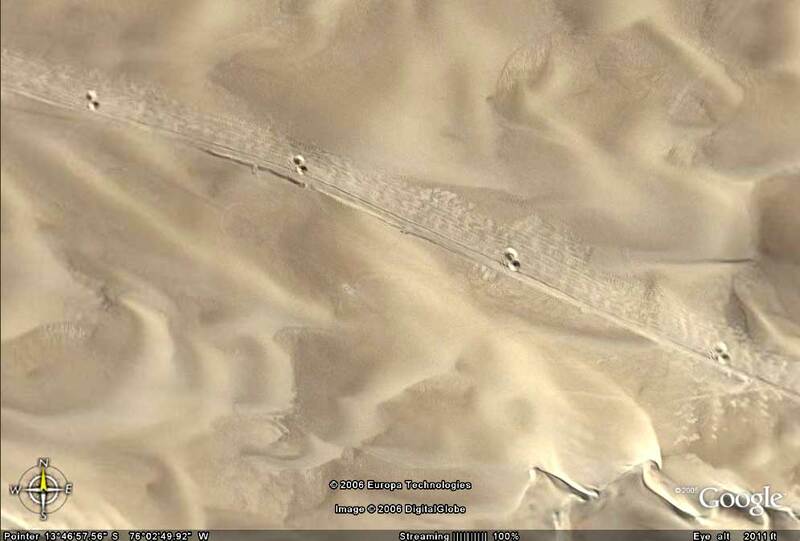 Go to Google Earth and follow the road. 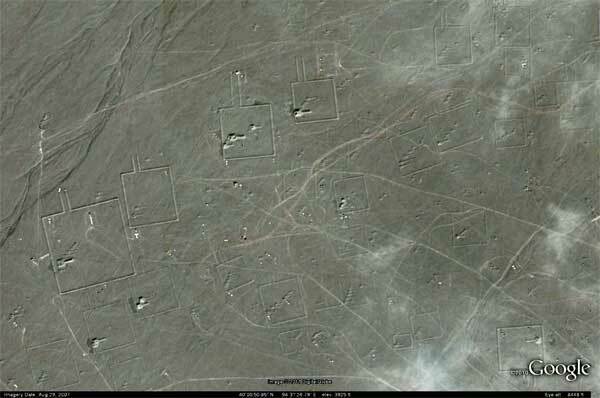 For coordinates enlarge any of the images below. Click on this last image to enlarge. 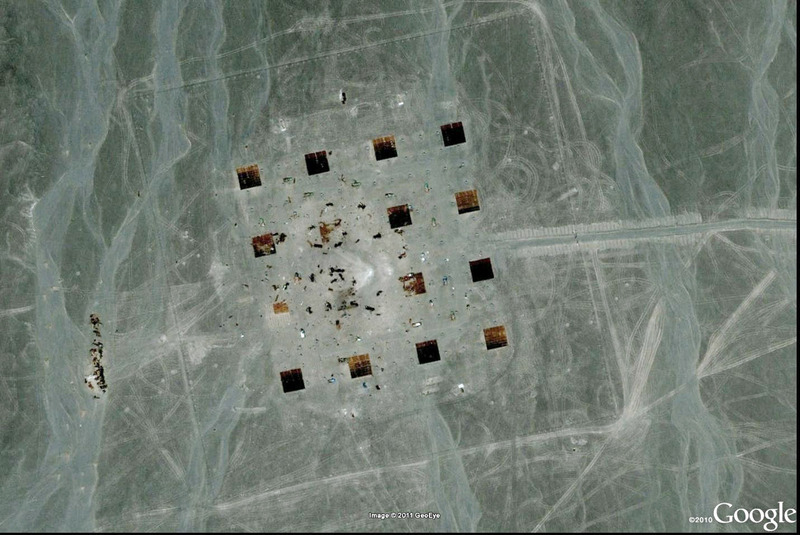 If you know what are items 1-10 marked on the Google Earth satellite photos below, please send us your feedback. 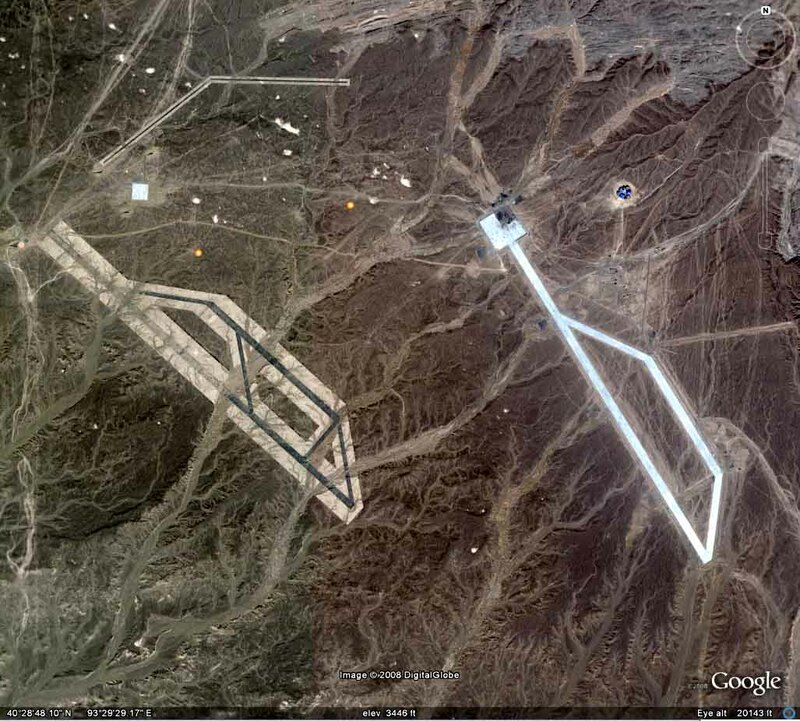 Perhaps it is a military installation, however few of the areas are difficult to interpret. 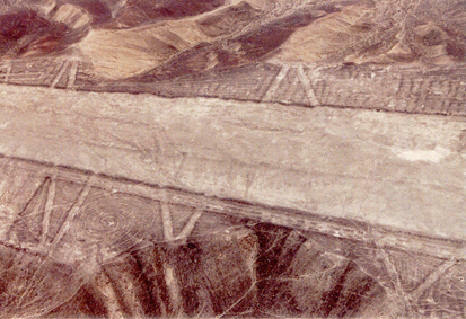 One of the "landing strips" looks ancient ( see erosion marks). 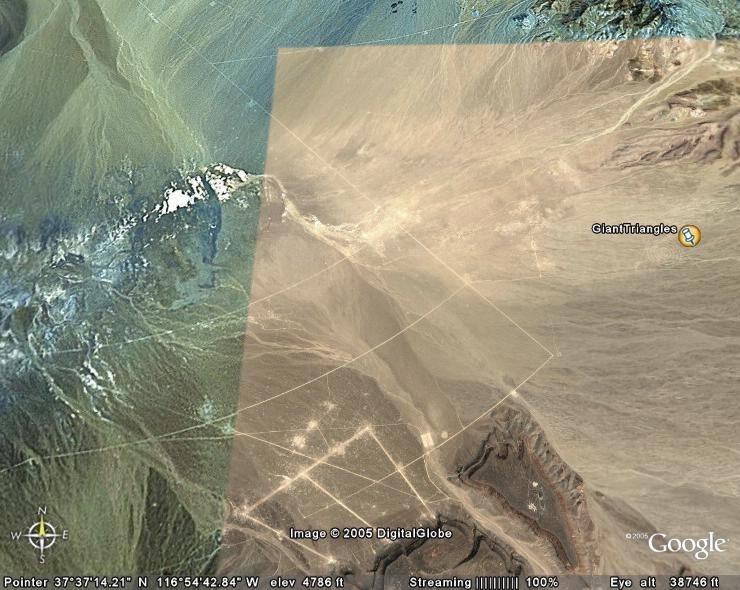 And just near the East edge of the Dunhuang there are many of "square outlines"
If one goes to Google earth an enters the latitude and longitude provided on the bottom of the first image, you can move the cursor around and see that the marks are not built up in elevation as an airport would be. Road graders and compactors are needed to pack a field sufficiently to safely take the extreme pressure that landing gears make at times. Any yielding of the dirt would cause the plane to spin out of control. 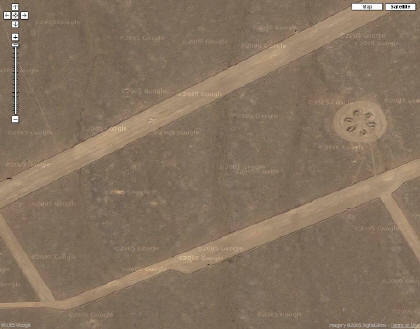 Of course, there are no support buildings or taxiways to parking areas. 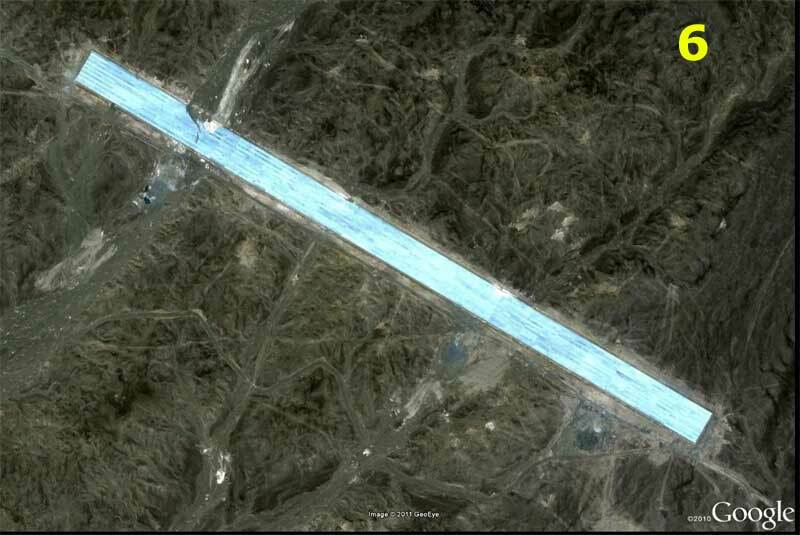 How old is this Chinese landing strip on the left? 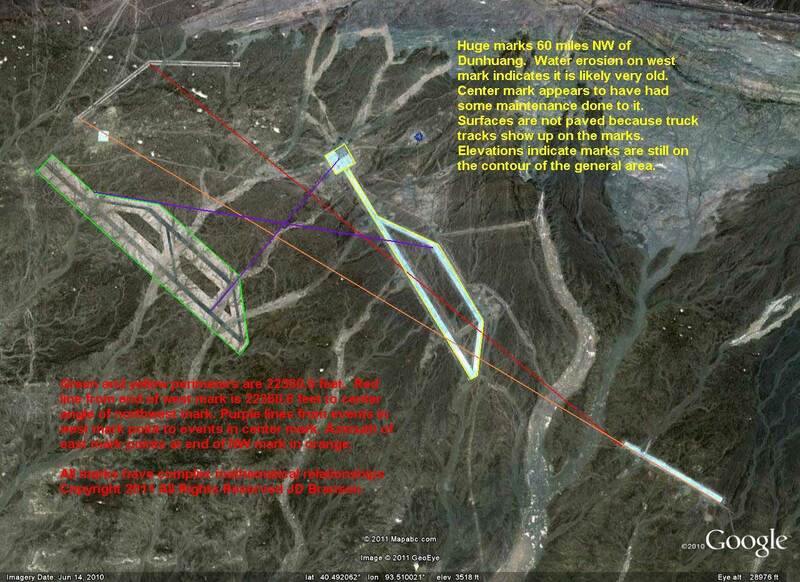 Click on this last image to enlarge. 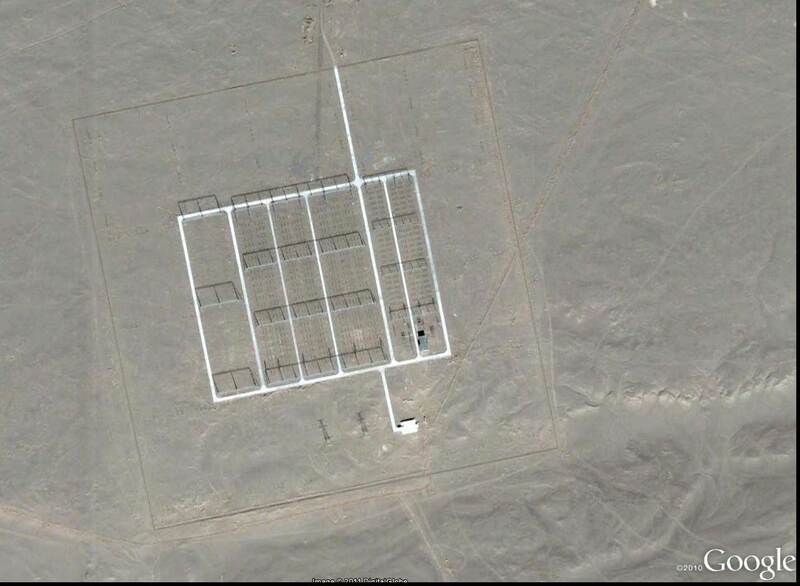 I am a retired engineer doing research with Google Earth. 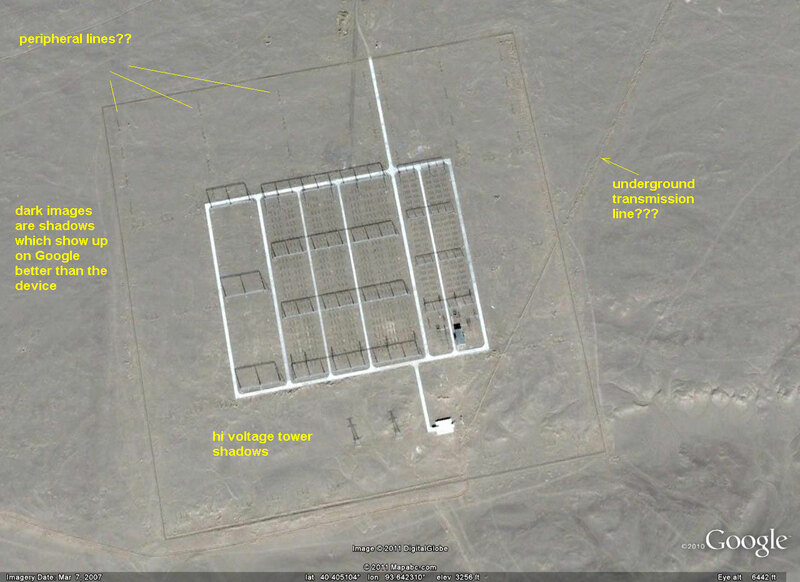 I analyzed image of the "Chinese Airport". 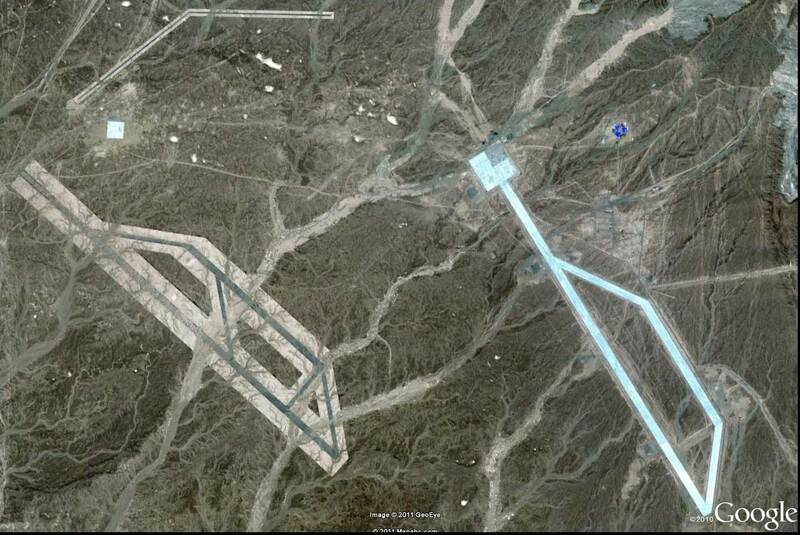 The total outside perimeter of the left (west) airport is 22360.6 feet, somewhat precisely the square root of 5. 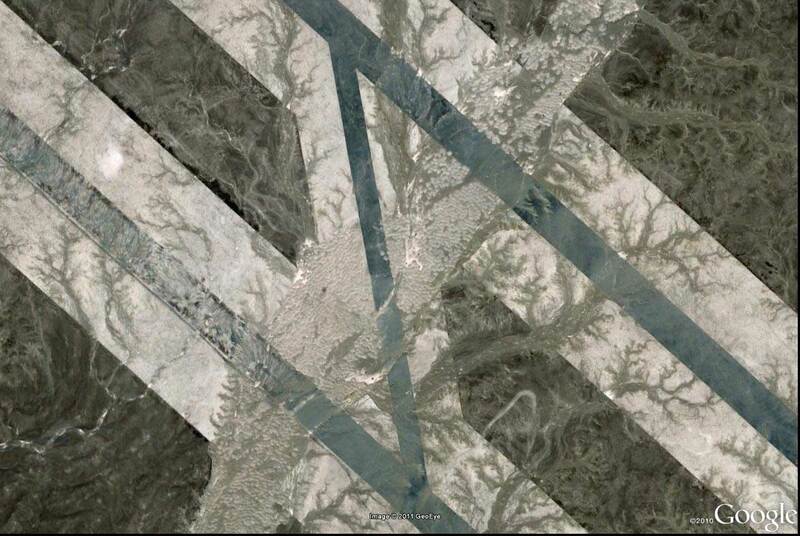 The outer perimeter of the dark section is 22360.6 / 16 / A where A= E -1 = 1.718281828, the fractal portion of natural log base E. I seriously doubt anybody in modern times would design anything like that. 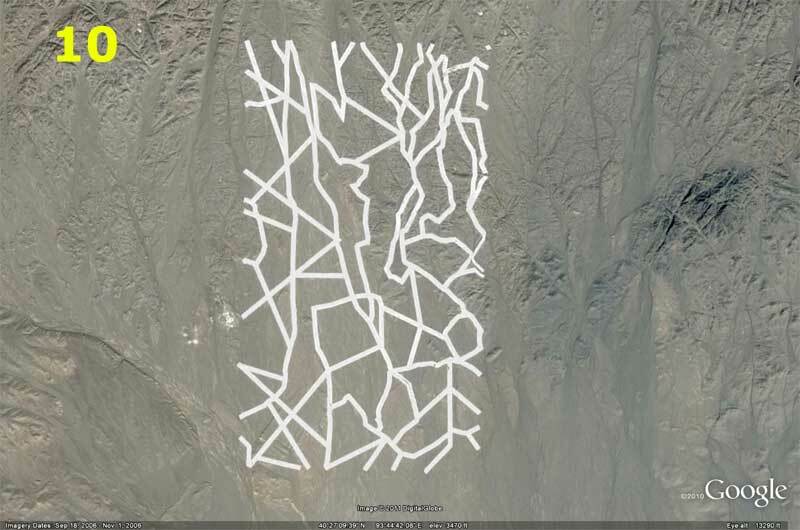 One may also see that common truck traffic has made tracks out across a number of the marks and therefore it cannot be paved or a prepared surface. 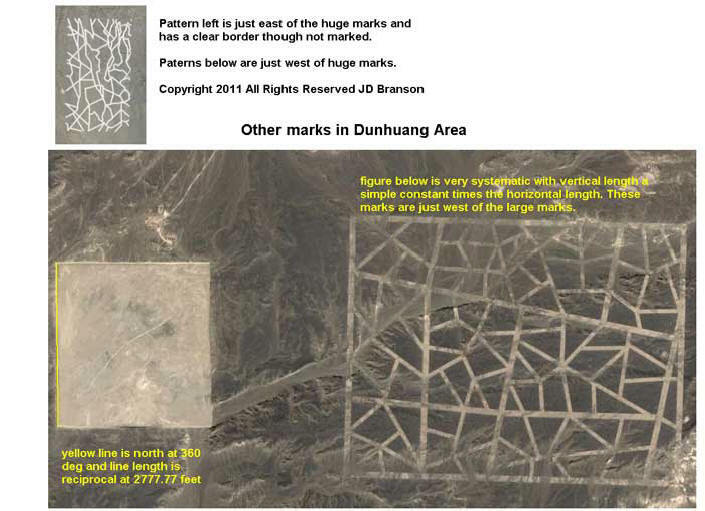 If the marks were graded and compacted, they would be nearly perfectly level lengthwise and side to side. 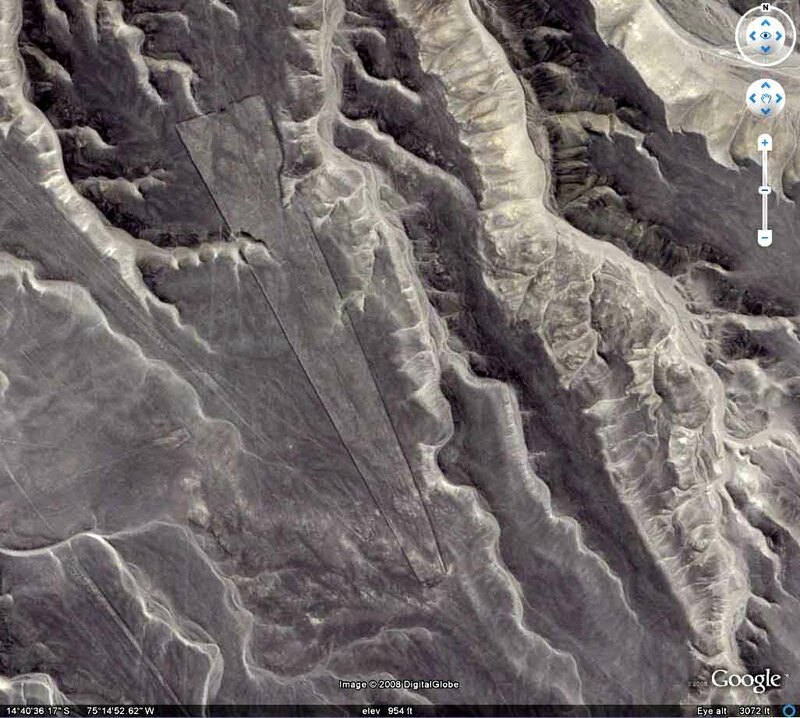 When tracing the contour with GE they still show the general contour of the area around them. 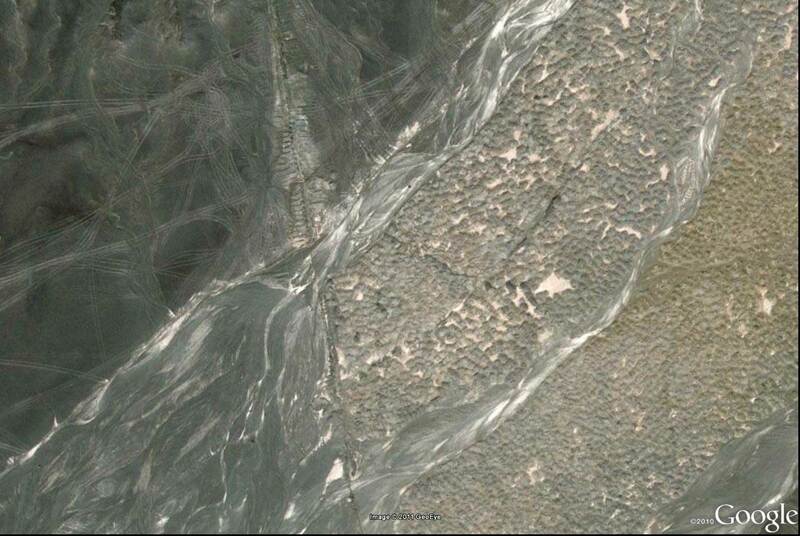 Water erosion on the west mark indicates that this desert area was once quite a bit moister and the marks were already there during heavy rains or snow runoff. 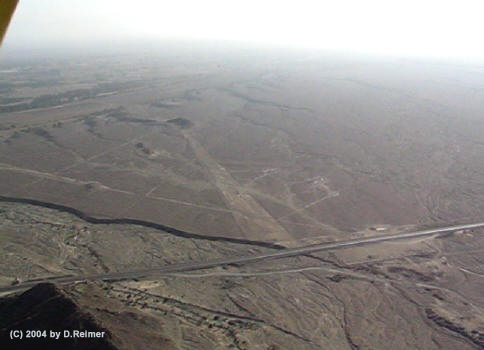 Even the darker colored areas which one might be tempted to think are paved show signs of erosion. There are some simple considerations to prove the designs are inter-related. 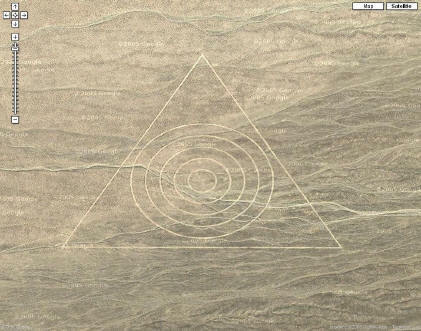 The left mark has the perimeter traced in green and the center likewise in yellow. Both of these perimeters are 22360.6 feet in length, plus or minus a few feet. 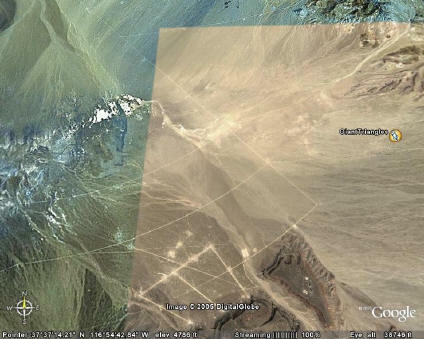 The red line connecting the SW corner of the east mark with the center angle of the NW mark is also this same length, which most people will realize is the square root of 5 = 2.236068. This is also the source number for the sacred number of phi (1.618033989) used repeatedly in natural events. Then I have also shown using orange that the right mark points at the left end of the northwest angle mark. The distance is 4000 x pi = 12,566.37 plus or minus a few feet. Then too I have marked in purple some lines indicating the left mark is probably pointing at events in the center mark. All these events cannot be accidental. But there are far too many mathematical relationships being developed using AutoCAD and MathCAD software to describe no and they will be dealt with later. I am not at all certain why the center and the right mark show up so brightly on Google earth but I have seen this type of phenomena before and it could be something in the Google software that causes it to be so pronounced. 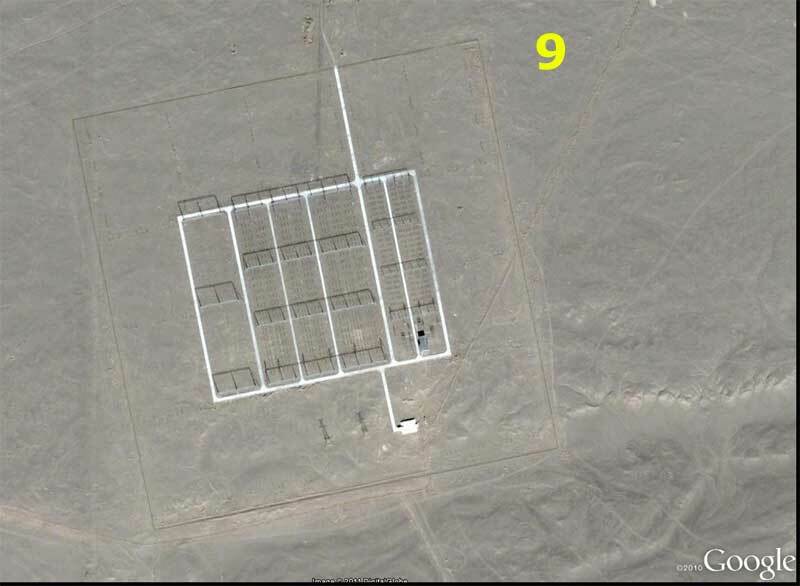 But there actually are some patterns in both of those marks that resemble bar coding systems which I will develop later. 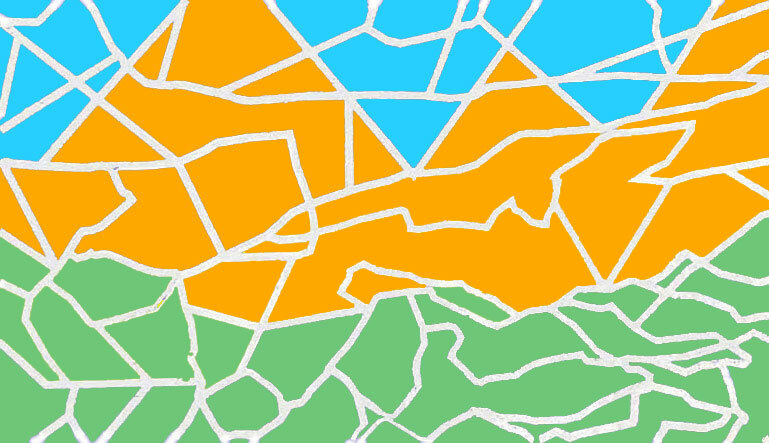 The purpose of this article is to remain simple and not bore people with complex mathematics. 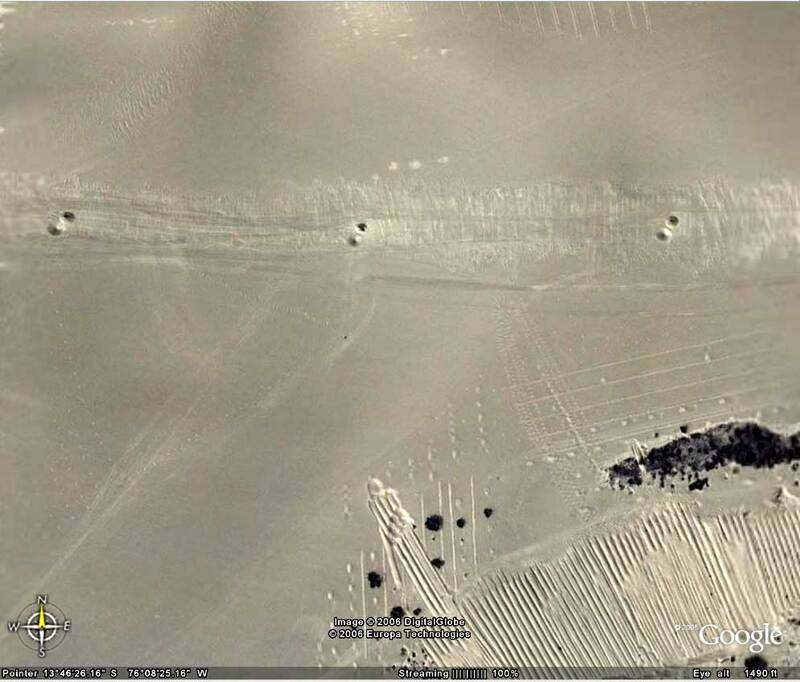 The marks below are just east and west of the huge marks above. These marks could contain an encyclopedia of data if one breaks the coding. 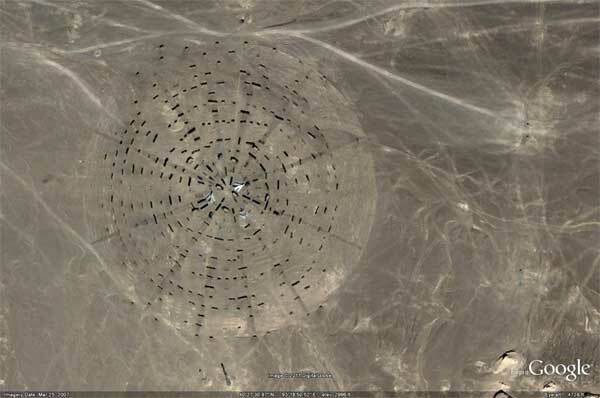 The near square in the bottom left is not only oriented true north at an azimuth of 360 degrees (also zero) but the length is 2777.77 feet which is the reciprocal of 36 times 10,000. This seems likely some type of signal to provide methodologies for more complex solutions. One might wonder why I am using feet instead of meters, and the answer is simple…..it works. There could be other systems in metric units, but I have not discovered them yet. The pattern on the bottom right is yielding some mind boggling relationships. 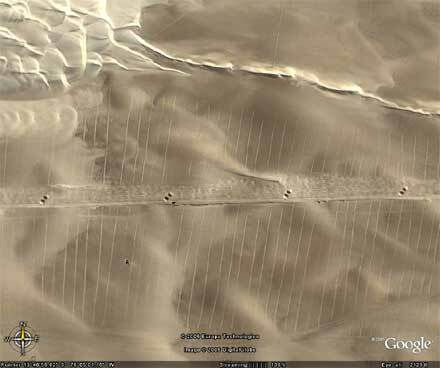 Note the water erosion across some of the pattern, again indicating it could be really ancient. 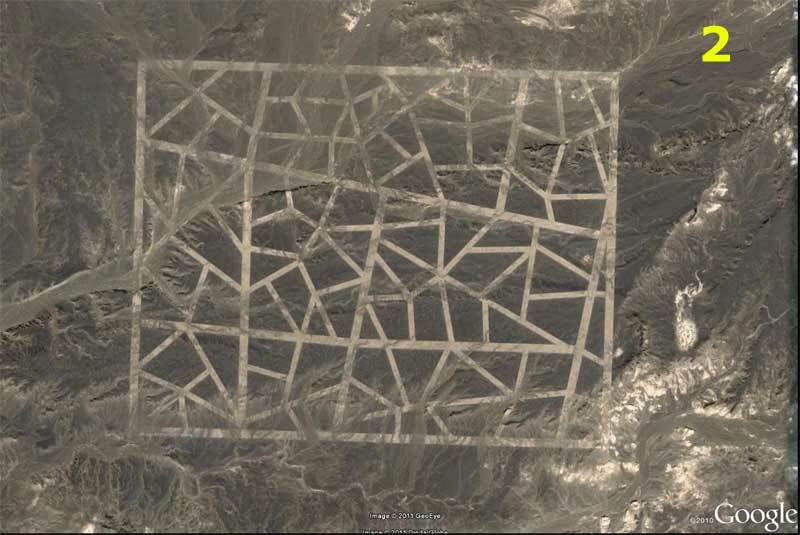 I am not trying to indicate that these patterns are necessarily derived from anything like ancient aliens or even abnormal human abilities like savants. I am just trying to provide insight into the design. I fully expect that the ultimate solutions will provide convincing evidence as to what type of intelligence put them there. 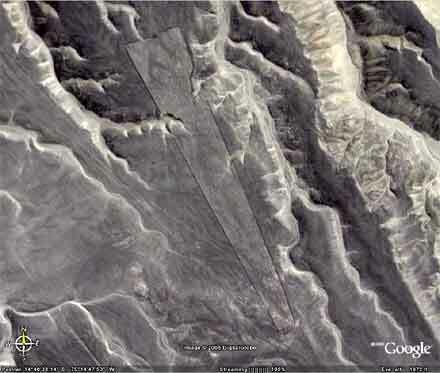 "Dead Men's Secrets" by Jonathan Gray is 373 pages of discovering ancient technology and lost secrets. 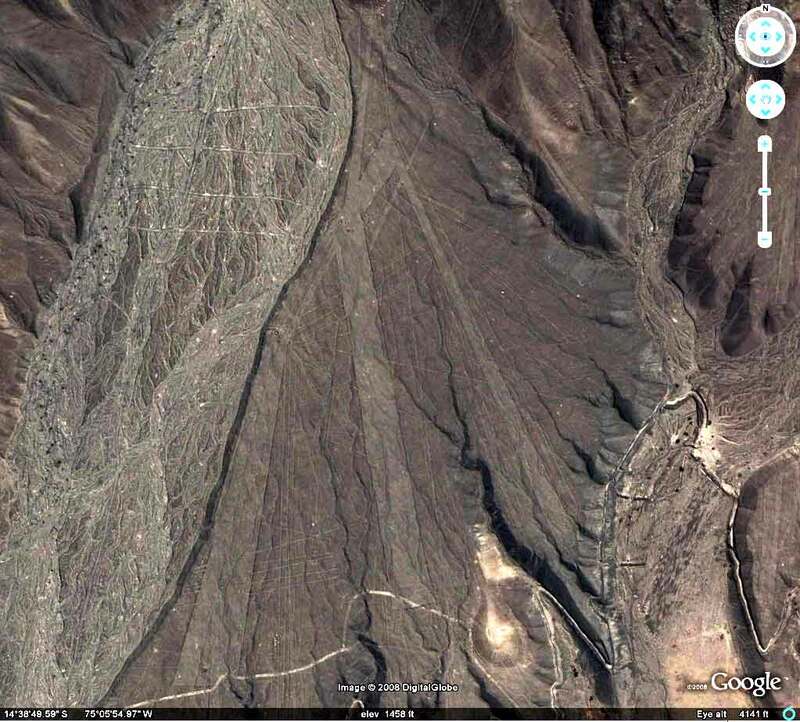 of Planet Earth AFTER the Flood, and its effect upon human history. 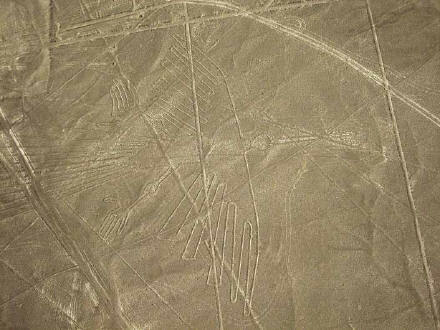 Description: Nazca Lines in Peru. Alternative theories, popular authors, books, and resources on the Internet.